From Gucci's G-Timeless collection, this Swiss Made timepiece is an enticing accessory perfect for the modern professional woman. With a minimalistic silver branded dial and contrasting hour markers beautifully complementing the stainless steel casing and bracelet, this stylish watch is designed to make a statement. 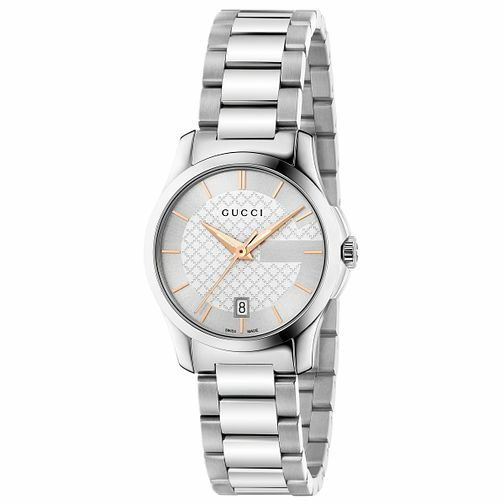 Gucci G-Timeless stainless steel bracelet watch is rated 5.0 out of 5 by 4. Rated 5 out of 5 by Anonymous from Lovely watch This watch is very elegant and classy, looks good dressed up or casual. Rated 5 out of 5 by Anonymous from Elegant ladies watch Really nice ladies watch bought for my daughters 18th birthday and she loves it. Watch is really good quality and looks very elegant.